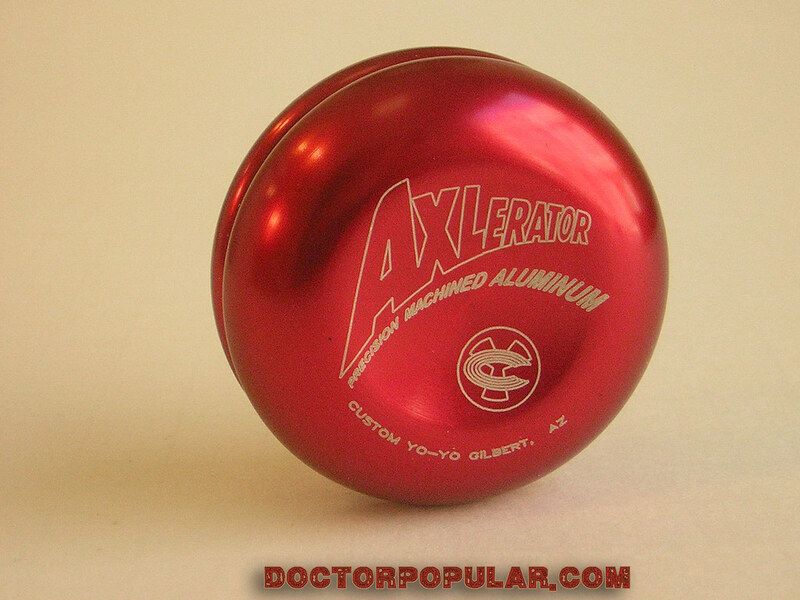 The AXLerator isn’t exactly the first narrow body aluminum yo-yo, but it’s probably the first one designed specifically for looping. 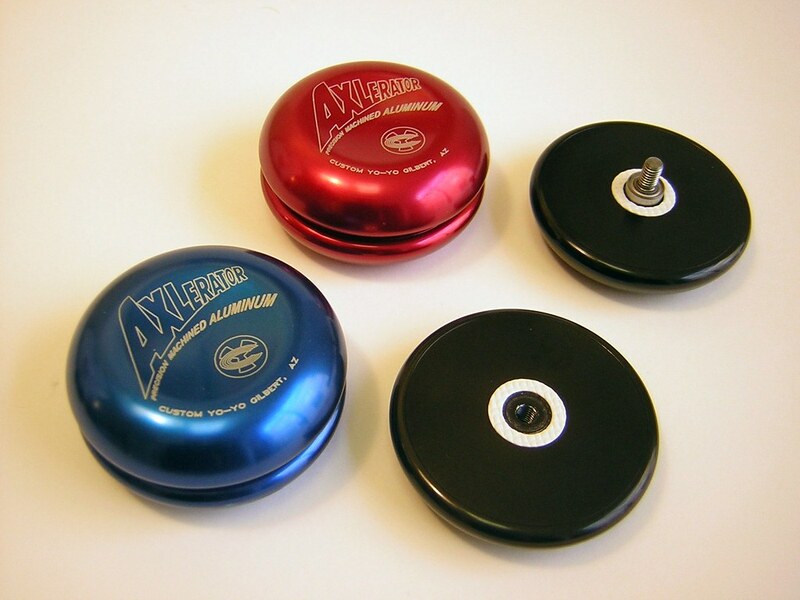 Up until it’s release, aluminum yo-yos were designed as “sleeping” yo-yos, but Custom didn’t see any reason that aluminum yo-yos couldn’t be used for two handed looping tricks so they gave it a shot. The AXLerator is a narrow body “Imperial” type design. Like the Roadster by Playmaxx, the sides are concaved, but since the body is hollow, this doesn’t exactly remove middle weight. 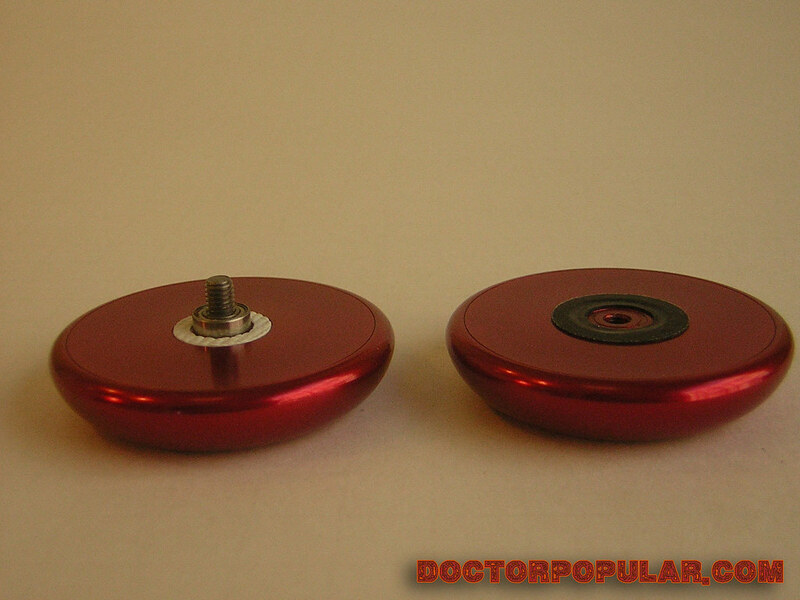 The yo-yo didn’t catch on, the two handed yo-yo market was dominated by the Yomega Raider (which is still a standard) and the AXLerator didn’t really offer any improved looping action. I think the biggest flaw in Custom’s design is it’s lack of gap adjustment. Even with brand new “tub tread response” (Custom’s friction sticker) the yo-yos would loop upward. This would only get worse as the stickers got worn in, thus increasing the gap. 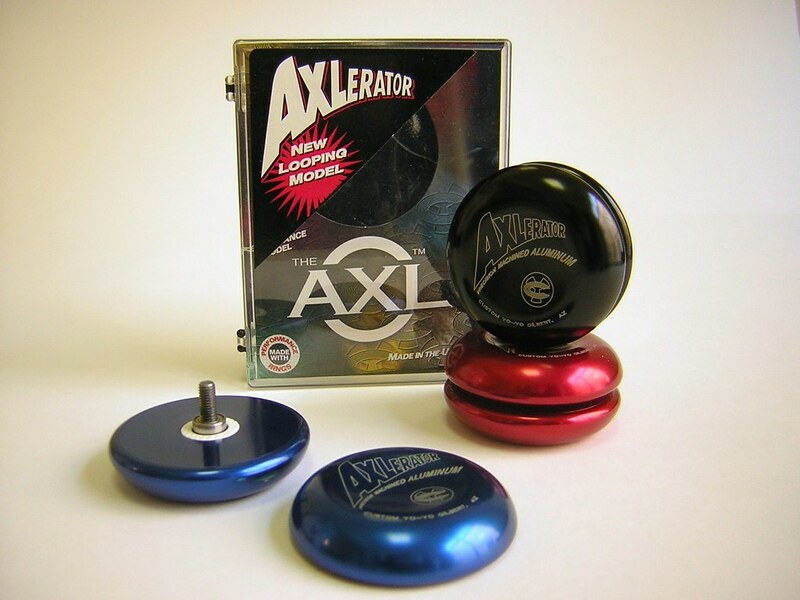 The AXLerator appears to be heavy for a looping yo-yo but it’s only 1 gram heavier than the Raider. Gap issues aside, the yo-yos are very pleasant to use and loop surprisingly well. Actually, if Custom could just narrow the gap I’d quite enjoy this yo-yo. i really love how you are able to put a perspective into all these yoyo’s showing when they were created and what else was out there. that makes for some really awesome reading and gives good insight into these. keep it up! !